Omnes scientiae sunt connexae et fovent auxiliis sicut partes ejusdem totius, quarum quaelibet opus suum peragit non propter se sed pro aliis. 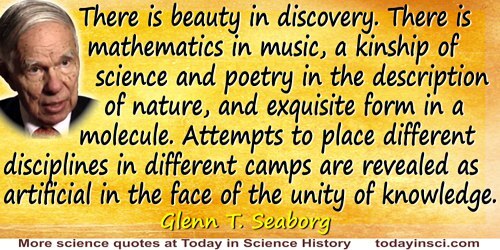 All sciences are connected; they lend each other material aid as parts of one great whole, each doing its own work, not for itself alone, but for the other parts; as the eye guides the body and the foot sustains it and leads it from place to place. Opus Tertium [1266- 1268], chapter 4, Latin text quoted in J. B. Bury, The Idea of Progress (1920), 355 (footnote to page 25). In J. S. Brewer (ed. ), Fr. Rogeri Bacon Opera ... inedita (1859), 18. But why, it has been asked, did you go there [the Antarctic]? Of what use to civilization can this lifeless continent be? ... [Earlier] expeditions contributed something to the accumulating knowledge of the Antarctic ... that helps us thrust back further the physical and spiritual shadows enfolding our terrestrial existence. Is it not true that one of the strongest and most continuously sustained impulses working in civilization is that which leads to discovery? As long as any part of the world remains obscure, the curiosity of man must draw him there, as the lodestone draws the mariner's needle, until he comprehends its secret. During the time of the Deluge, whilst the Water was out upon, and covered the Terrestrial Globe, … all Fossils whatever that had before obtained any Solidity, were totally dissolved, and their constituent Corpuscles all disjoyned, their Cohesion perfectly ceasing … [A]nd, to be short, all Bodies whatsoever that were either upon the Earth, or that constituted the Mass of it, if not quite down to the Abyss, yet at least to the greatest depth we ever dig: I say all these were assumed up promiscuously into the Water, and sustained in it, in such a manner that the Water, and Bodies in it, together made up one common confused Mass. That at length all the Mass that was thus borne up in the Water, was again precipitated and subsided towards the bottom. That this subsidence happened generally, and as near as possibly could be expected in so great a Confusion, according to the laws of Gravity. In An Essay Toward A Natural History of the Earth (1695), 74-75. Every one who has seriously investigated a novel question, who has really interrogated Nature with a view to a distinct answer, will bear me out in saying that it requires intense and sustained effort of imagination. In The Principles of Success in Literature (1901), 66. Good lawyers know that in many cases where the decisions are correct, the reasons that are given to sustain them may be entirely wrong. This is a thousand times more likely to be true in the practice of medicine than in that of the law, and hence the impropriety, not to say the folly, in spending your time in the discussion of medical belief and theories of cure that are more ingenious and seductive than they are profitable. Introductory lecture (22 Sep 1885), Hahnemann Medical College, Chicago, printed in United States Medical Investigator (1885), 21, 526. It is better for all the world, if instead of waiting to execute degenerate offspring for crime, or to let them starve for their imbecility, society can prevent those who are manifestly unfit for continuing their kind. The principle that sustains compulsory vaccinations is broad enough to cover cutting Fallopian tubes. Three generations of imbeciles are enough. Chief Justice Holmes contributed this opinion to the judgment by which the sterilization law of Virginia was declared constitutional. Quoted from Journal of Heredity (1927), 18, 495. In Henry Ernest Sigerist, Civilization and Disease (1970), 105. Nature, displayed in its full extent, presents us with an immense tableau, in which all the order of beings are each represented by a chain which sustains a continuous series of objects, so close and so similar that their difference would be difficult to define. This chain is not a simple thread which is only extended in length, it is a large web or rather a network, which, from interval to interval, casts branches to the side in order to unite with the networks of another order. 'Les Oiseaux Qui Ne Peuvent Voler', Histoire Naturelle des Oiseaux (1770), Vol. I, 394. Trans. Phillip R. Sloan. The essayist is … sustained by the childish belief that everything he thinks about, everything that happens to him, is of general interest. First line of Foreword in Essays of E.B. White (1977, 2014), vii. The highway system devours land resources and atmosphere at a rate that is impossible to sustain. The thesis which I venture to sustain, within limits, is simply this, that the savage state in some measure represents an early condition of mankind, out of which the higher culture has gradually been developed or evolved, by processes still in regular operation as of old, the result showing that, on the whole, progress has far prevailed over relapse. In Primitive Culture (1871), Vol. 1, 28. The whole Terrestrial Globe was taken all to Pieces and dissolved at the Deluge, the Particles of Stone, Marble, and all other solid Fossils being dissevered, taken up into the Water, and there sustained with Sea-Shells and other Animal and Vegetable Bodyes: and that the present Earth consists, and was formed out of that promiscuous Mass of Sand, Earth, Shells, and the rest, falling down again, and subsiding from the Water. In An Essay Towards a Natural History of the Earth (3rd ed., 1723), Preface. There are many examples of old, incorrect theories that stubbornly persisted, sustained only by the prestige of foolish but well-connected scientists. ... Many of these theories have been killed off only when some decisive experiment exposed their incorrectness. In Hyperspace: A Scientific Odyssey Through Parallel Universes, Time Warps, and The Tenth Dimension (1994), 314. Thus the great drama of universal life is perpetually sustained; and though the individual actors undergo continual change, the same parts are ever filled by another and another generation; renewing the face of the earth, and the bosom of the deep, with endless successions of life and happiness. Geology and Mineralogy, Considered with Reference to Natural Theology (1836), Vol. I, 134. Until that afternoon, my thoughts on planetary atmospheres had been wholly concerned with atmospheric analysis as a method of life detection and nothing more. Now that I knew the composition of the Martian atmosphere was so different from that of our own, my mind filled with wonderings about the nature of the Earth. If the air is burning, what sustains it at a constant composition? I also wondered about the supply of fuel and the removal of the products of combustion. It came to me suddenly, just like a flash of enlightenment, that to persist and keep stable, something must be regulating the atmosphere and so keeping it at its constant composition. Moreover, if most of the gases came from living organisms, then life at the surface must be doing the regulation. Homage to Gaia: The Life of an Independent Scholar (2000), 253. What would life be without art? Science prolongs life. To consist of what—eating, drinking, and sleeping? What is the good of living longer if it is only a matter of satisfying the requirements that sustain life? All this is nothing without the charm of art. The Art of the Theatre (1924), 177. When I came home not a single acre of Government, state, or private timberland was under systematic forest management anywhere on the most richly timbered of all continents. ... When the Gay Nineties began, the common word for our forests was 'inexhaustible.' To waste timber was a virtue and not a crime. There would always be plenty of timber. ... The lumbermen ... regarded forest devastation as normal and second growth as a delusion of fools. ... And as for sustained yield, no such idea had ever entered their heads. The few friends the forest had were spoken of, when they were spoken of at all, as impractical theorists, fanatics, or 'denudatics,' more or less touched in the head. What talk there was about forest protection was no more to the average American that the buzzing of a mosquito, and just about as irritating. Breaking New Ground (1998), 27. Without undervaluing any other human agency, it may be safely affirmed that the Common School, improved and energized, as it can easily be, may become the most effective and benignant of all the forces of civilization. Two reasons sustain this position. In the first place, there is a universality in its operation, which can be affirmed of no other institution whatever... And, in the second place, the materials upon which it operates are so pliant and ductile as to be susceptible of assuming a greater variety of forms than any other earthly work of the Creator. Twelfth Report of the Secretary of the Massachusetts Board of Education (1948). Life and Works of Horace Mann (1891), Vol. 4, 232-233.